Residential Fences by Accokeek Fence Company Northern Virginia wood or metal fence installation picket fence, split rail fence, ranch fence, security fence, privacy fence, paddock fence, estate fence, custom fence, chain link fence VA, Washington DC. Fencing, Fences, Residential Wood Fence, Metal Fencing, Decorative Fences, Fencing Repairs, Fencing Alterations, Fence Additions, Fence Clearing, and Fence Removal in Springfield, Lorton, Burke, Fairfax Station, Fairfax, Arlington, Falls Church, Alexandria and all of Northern Virginia, Montgomery County, and Washington, DC since 1985. Agricultural Wood Fence Styles are available in rustic western red cedar, pine and locust, and treated pine. Choose from 2-rail, 3-rail, and stacked fence varieties. Special fence orders and custom orders accepted. 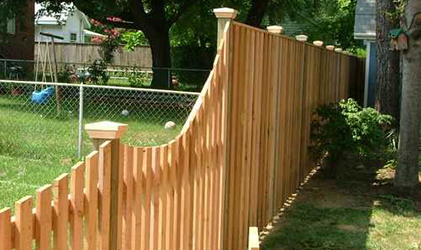 Residential Wood Fence Styles are available in numerous heights from 3' high and up. Spaced picket fences are available with picket tops in the following styles: dog eared, dog ear curved, French gothic, English gothic, and standard gothic. We also offer decorative post tops cut right into the post or fancy post caps. We offer picket fences prebuilt in 8' wide panels in both western red cedar and treated pine species. Choose from our prebuilt fence panels, or order individual western red cedar fencing components to stick build your own fence style. 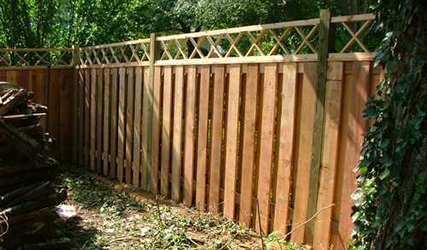 Privacy Wood Fence Styles are typically supplied 6' high, however can be built to nearly any height. Plain end and dog eared picket tops are popular. Economical spruce stockade panels are also available in a few different heights. Wood Gates, Gate Hardware, & Fence Accessories - From quality made English style five bar gates to custom built steel gate frames for wood gates, we have the best selection, best pricing, and best service for your wood fence project. Contact us today to take advantage of our almost 30 years of fence building experience, unbeatable prices, and unparalleled service. Post Caps are available in over 100 styles. Some caps have copper or brass accent tops. Included are a selection of caps made in various types of wood including treated pine, cedar, mahogany, redwood and oak. We even carry solar caps and low voltage caps to light up your deck or walkway. Wood Hardware is sold for fence and gates that are both decorative and functional. Included are hinges, latches, handles, gate closers and much more. All of our hardware are the best available and can also be purchased in quantities at a discount.